HOUSTON — State Representative Armando Walle (D-Houston) hosted his inaugural senior citizen dance on Friday, August 20, at the Northeast Harris County Senior Center. More than 100 senior citizens from the Hardy Senior Center, Northeast Senior Center, and North Central Senior Center came together to dance, enjoy refreshments and pose in keepsake photos at the event. The Senior Dance was made possible in large part through sponsors such as, East Aldine District, AT&T and the Northside Redevelopment Center. In addition to Walle, notable attendees included Congressman Gene Green, Commissioner Sylvia Garcia and Sheriff Adrian Garcia. The local officials thanked the seniors for their long service to the community. Representatives from the offices of Senator Mario Gallegos, Representative Ana Hernandez and Commissioner El Franco Lee also came by in support. “Hosting the senior dance was a pleasure and I look forward to making it an annual event. I appreciate our community’s involvement and great response to this successful event. After the years of service our seniors have provided to the community, I was happy to host them for a celebration in their honor,” said Walle. A spectacular 3 alarm fire ripped through the Harris County warehouse at the corner of Canino and Downey on the Northeast side early Friday morning, destroying the building and the voting equipment contained within. In the early morning hours of Aug. 27 a three-alarm blaze struck the Harris County Election Technology Center in the 600 block of Canino Road. According to county fire officials, more than 200 firefighters battled the blaze, which started about 4 a.m. It took about four hours to extinguish the fire. Firefighters spent the rest of the day cooling the debris with water, as Arson investigators stood by to look for the cause, which at this time is not known. Hector DeLeon, with the county clerk’s office said that all of the county’s voting machines, more than 10,000 of them, were housed in the building and were likely destroyed or otherwise damaged by fire, water and smoke. The building had a sprinkler system, but it is not known at this time whether it was working or activated during the fire. The Harris County Veterinary Building next to the warehouse was not affected by the fire, except to have to close for a day due to the fire. In a case of good timing, Aldine’s election will not be affected. 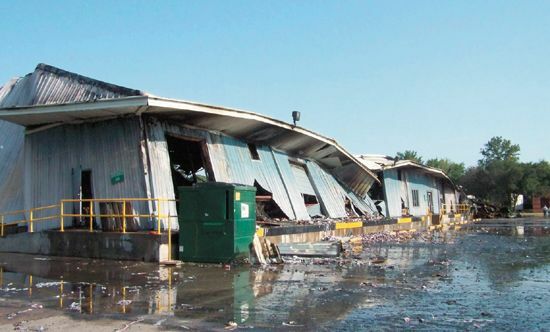 A fire that destroyed a Harris County warehouse, which housed all of the county’s voting machines, will not negatively impact the school district tax rollback election on Aug. 31. Aldine ISD Spokesman Mike Keeney said that four days before the fire they took possession of the machines they would need for election day. The county has asked Aldine to maintain storage of the machines that they also used for early voting. As of press time, investigators were still going through the wreckage to determine the extent of the damage and a possible cause for the fire. It is estimated that the loss of the machines could reach $30 million, while the building itself would cost $10 million to replace. Early voting for the Nov. 2 gubernatorial race is scheduled to begin on Oct. 18. Several alternate methods are under study on how to conduct the election. DeLeon said that they may borrow machines from other jurisdictions, so that the election could proceed as planned. However, another plan is to use paper ballots and scanners, or alternatively extend the time for early voting. In any case, voters will be encouraged to use mail in ballots where applicable. NORTHEAST — Harris County Citizens Corps is currently conducting an 8-week CERT training class, with 46 enrolled participants from the Northeast/Aldine area. CERT stands for Community Emergency Response Team, and the concept is to train citizens to be first responders to emergencies, before public safety officials can arrive, or in the case of large emergencies, to be able to offer aid in lieu of officials. Classes are being held at the ESD#1 building on Aldine-Bender Road, and started on July 22 and will end on September 9. Persons interested in the classes can contact Richard Cantu at 713-595-1220 for future enrollment. The course is free, and offered through the Harris County Office of Homeland Security and Emergency Management, and is co-sponsored by East Aldine District, and hosted by ESD#1. CERT training is designed to prepare you to help yourself, your family, and your neighbors in the event of any anticipated disruptions and potential hazards before and following a disaster. 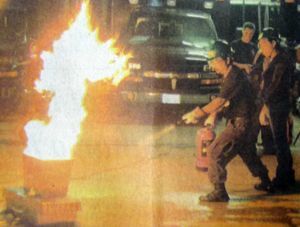 Should emergency personnel not be available, you can use this training to save lives and protect property. Additional information about CERT and the Harris County Citizen Corps is available at >www.harriscountycitizencorps.com. NORTHEAST — Last Saturday, Greenspoint Mall along with 8 other sponsors, held a Health Expo and Back to School event to prepare children for their return to school. Mall assistant manager Petra Owens said that the Expo was well attended, and all the gifts were expended in the first few hours. Included in the day’s events were health screenings, immunizations, I.D. kits, fun activities, and presentations of health life styles on the Health Stage. Also, 1000 free backpacks stuffed with school supplies were given out by Community Health Choice and the other sponsors, which included the YMCA, Houston and Harris Count Health Departments, and others. The Health Expo also included information and assistance with CHIP and Medicaid. 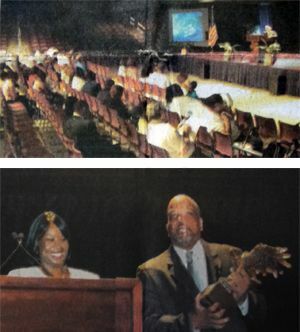 The spacious Campbell Center in Aldine was the venue for last week’s Financial Freedom Conference, presented by Andrew Watkins of the Watkins Group and the Pennsylvania Life Insurance Company. Many hundreds of interested persons attended, to hear the speakers and learn about opportunities for financial progress and success in their careers and lives. The conference was designed to bring the community and its businesses, groups, and organizations together and extend to each attendee information concerning increasing their income, reducing debt, expanding business opportunities, increasing awareness of community resources, and other ideas designed to impact the current status of participants. Watkins expects to repeat the conference again later in the year. For information, call 281-227-6847. The Texas Education Agency has announced report cards for area school districts, and the results are mixed for Aldine and North Forest ISD. The state’s accountability ratings are based on the percentage of students passing the Texas Assessment of Knowledge and Skills (TAKS) test, whether a school reached the state’s Required Improvement mark, and completion (graduation) rates for 2009. Aldine had 29 Exemplary campuses (the highest rating available), 27 Recognized, and 4 Academically Acceptable campuses. 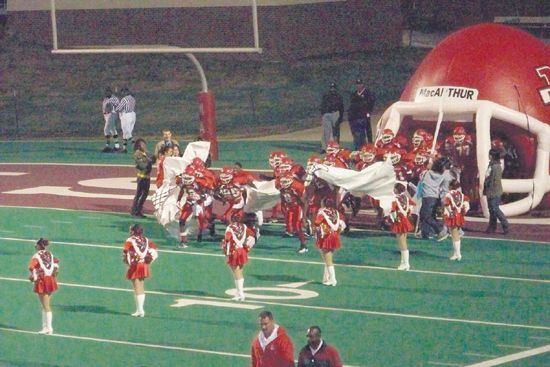 As a district, Aldine was ranked Academically Acceptable. Carver High School for Applied Technology earned Exemplary status. Their lowest test scored was in African American math with an 83% passage rate. They also had a 98.4% completion rate in 2009, or 185 out of 187 graduating. The state breaks down test scores in four subgroups: African American, Hispanic, White, and Economically Disadvantaged. MacArthur was ranked Recognized. Aldine got the Acceptable ranking. Nimitz also ranked Acceptable. Eisenhower’s failure to meet the required improvement levels helped give them an Acceptable rating. Among Ninth Grade campuses, Aldine, Eisenhower and Nimitz all hit Recognized status, while MacArthur got the top prize, Exemplary. Despite 6 Recognized campuses and 1 Acceptable campus, as a district North Forest was declared Academically Unacceptable. They were 1 of 30 in the state to receive that ranking. This was due in large part to the North Forest High School also making Unacceptable. Students at the school failed to meet required improvements in 3 out of 4 areas in reading and all 4 subgroups in science. While an average of 48% of students passed the math test, they did meet required improvements in 3 of 4 areas. The school posted a 61.1% completion rate in 2009. While up 2.1% from 2008, it failed to meet the state-required 8% improvement. The Greenspoint District’s effective and successful public safety programs have earned the district a prestigious crime prevention award. 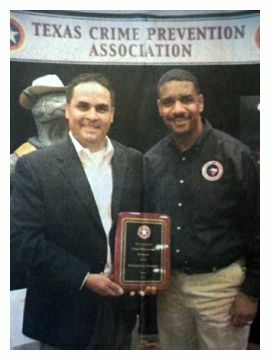 The Texas Crime Prevention Association (TCPA), a non-profit dedicated to promoting best practices in crime prevention, recently presented the Greenspoint District with an “Outstanding Crime Prevention Business” award at its annual conference. The award is given to organizations that reduce crime and provide the greatest support to crime prevention programs. The Greenspoint District also won the organization’s “Outstanding Crime Prevention Organization” award in 2008. These programs have yielded measurable reductions in crime. According to statistics from HPD and Harris County, since the district was created in 1991, Greenspoint has experienced a 42 percent reduction in Part 1 crimes (major crimes) per 1,000 people. Furthermore, these reductions were realized even though the area’s population has increased by 48 percent and employment has increased by 106 percent.